Now, tired of the game, Magiere and her partner the half-elf Leesil, are ready to hang up their weapons and settle down in a place they can finally call home. But their newfound peace will not last - for Magiere has come to the attention of a trio of powerful and dangerous vampires who know her true identity - and fear the birthright that flows through her veins. And they will stop at nothing to keep Magiere from fulfilling her destiny. 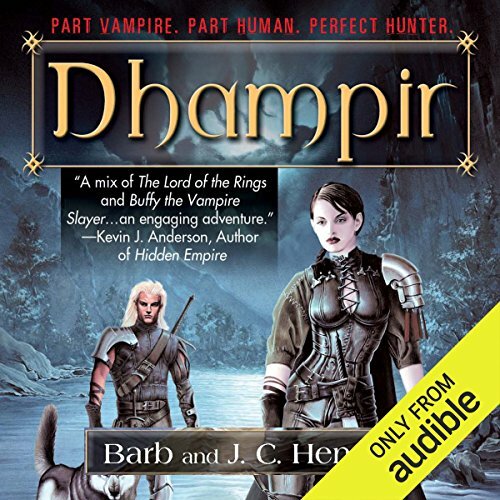 ©2003 Barb and J. C. Hendee (P)2014 Audible Inc. If you could sum up Dhampir in three words, what would they be? What was one of the most memorable moments of Dhampir? She remained consistent in the pronunciation of character names and town names, she didn't try to do accents she couldn't carry off, and it was appropriate, consistent speed. Yes, I only allowed myself to listen while working out. I worked out a lot so I could hear the whole story. I saw someone called the book depressing, but I did not find it so. It was along the lines of Terry Goodkind in terms of some people die, people have hard lives, the heroes quest continues, but, unlike Goodkind who includes endless hours of social colloquy with a story line here and there, this author stuck to the story and only the story, developing mysteries within mysteries and had me cheering for the heroes -- and the town. A friend suggested this book to me and now I am suggesting to any who like epic fantasy novels. Gripping action, fun story, Vampires & Elves! This first novel in the Noble Dead series has interesting characters in a medieval-type time period, lots of action, a mysterious history involving the main characters, and an engaging voice actress narrating the story. A young woman doesn't know she's half human, half vampire while she swindles small villages out of their valuables to rid them of a vampire stalking their inhabitants. She doesn't really defeat any vampires after being hired by the villagers, it's all a ruse and she and her elf companion leave the village with no coin. They are loathsome at first, knowingly taking the only coin a poor village has left which will likely doom them from sustaining them with food over the coming cold winter months. When they stumble upon a real vampire, the story takes off like a shot and the two main characters are forced to face who she really is and the morality of their past actions, while attempting to stay alive against grim odds. If this isn't enough, we also get the perspective of a group of vampires, their history and motivations, and find out that not all of them are truly evil. I won't spoil anything, but I came to like some of each of the humans, the dhampir, and the vampires...not all, because each has their good and back actors, but the vampires are continually pulled back into to the curse of their existence as Noble Dead. The narrator does a fine job voicing the females, but she has one tone for the males. It's not all that distracting, but she has a lot of emotion she put into the characters. Vampires, a grim goth-like setting in a medieval world with elves, ghosts, and magic makes for a fun setting for a pretty darn good story so far. My girlfriend wants me to read this series so bad because it's one of her favorites... But the narrator is so robotic that it forces me out of the story. Her sing song voice and tempo is formulaic and very distracting. She sounds like she's reading a sports radio program from the 1950's. I just can't get into a book if the reader is bad. I've started this book 3 times and have gotten about as far each time before I just can't listen to it anymore. I love this series. They story develops really well and draws you in. I have now read all of the first and second story arcs for the noble dead saga and the character development is amazing. Tanya Eby is a fantastic narrator and stays though the entire series. I would definitely recommend to anyone I have even gotten Co-workers reading the series. You must give it a try. hard to put down. I read this one about every two or three years and it's always worth the time to spend in the story. This is the most depressing, soul destroying and annoying novel I have listened to in a while. The protagonists are extremely dysfunctional and improve very little. The best character is the dog. The narration adds to the depression. My only problem is there isn't enough of them in audio yet and I love them all so very much :).